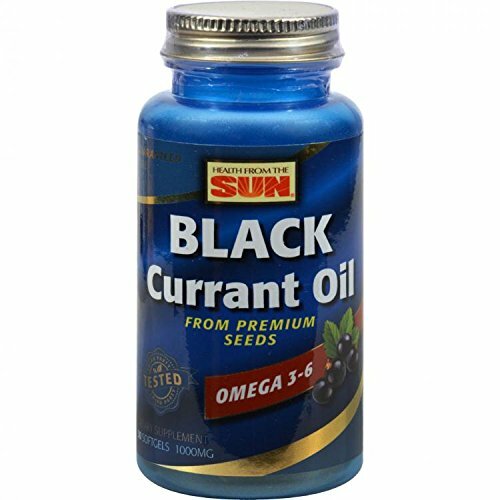 Rigourously Tested to Guarantee Oil Quality, Purity &Truth-In-Labelling;Pure Black Currant;Omega-3 + GLA;Dietary Supplement;Health From The Sun Black Currant 1000 naturally supplies the nutritional important omega-6 fatty acid, Gamma-Linolenic Acid (GLA) plus omega-3 Alpha Linolenic Acid (ALA) and Stearidonic Acid, an omega-3 fatty acid which is rarely found in foods. This combination of fatty acids is what makes black currant oil so unique among other plant nutritional oils. Each soft gel contains 1000 mg of pure black currant oil extracted from the highest quality black currant seeds. If you have any questions about this product by Health From The Sun, contact us by completing and submitting the form below. If you are looking for a specif part number, please include it with your message.